Pound 360: What's driving SoCal wildfires? Climate change or unchecked urban sprawl? What's driving SoCal wildfires? Climate change or unchecked urban sprawl? 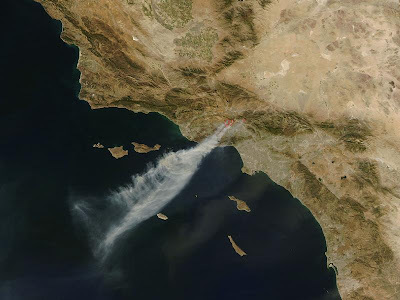 According to a post at the Wall Street Journal's environmental blog, both climate change (which leads to warmer temps and drier conditions) and irresponsible housing development ("the majority of new development in southern California also takes place in fire-prone areas") have helped create the broken record that is Southern California's devastating wildfire season. Flawed environmental policies, "like snuffing out small wildfires that traditionally eliminated underbush which now serves as kindling," are also to blame. The wildfires raging in Southern Cal at the moment have already killed two people, destroyed 64 structures and blackened 27,000 acres, reports the NY Times. And this is just the start.